Resilient flooring is flooring that has elastic properties and a “bouncy” feel as you walk on it. Resilient flooring is prized for its durability, comfort under foot, and ease of cleaning, which is why it can be found in residential and commercial buildings all across the country. Linoleum is another environmentally friendly flooring option. It is made from renewable materials, such as linseed oil, recycled wood powder, cork powder, and limestone. This inexpensive floor covering comes in a wide variety of colors and patterns, so it easily complements the décor in any home or business. Linoleum is also exceptionally long lasting; it can even last as long as 30-40 years! VCT or Vinyl Composition Tile is a synthetic flooring material typically cut into 12-inch squares that are then adhered to the floor. 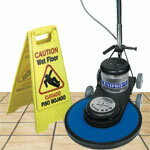 The tiles are then waxed and buffed using professional products and equipment. VCT is a low-cost flooring solution most often found in businesses and commercial institutions. This durable and easy-to-maintain floor covering also comes in a wide variety of colors, some of which can even resemble wood, stone, or other materials. 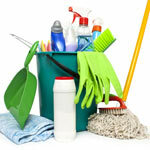 Sheet goods, solids, or pure vinyl is a soft flooring material that can be easily scratched. This material is considered a sanitary floor, as the seams are chemically or heat-welded. This flooring material is resistant to solvent acid and alkaline spots. It generally comes in 6- to 12-foot widths and many colors and styles. Rubber flooring is, just as the name suggests, made from rubber. Rubber floors are most often installed as tiles or pads, can be found in environments where people spend a lot of time on their feet. 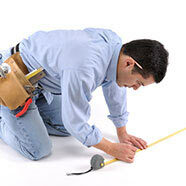 The “bouncy” nature of the floor is quite comfortable and reduces pain and stress on the feet and joints of workers. For this reason, it is sometimes referred to as “anti-fatigue flooring.” Rubber flooring is also useful to control static, which makes it a preferred floor covering in environments with a lot of electronics that can be damaged by static. All types of resilient flooring are generally stain and water resistant, durable, and comfortable to stand or work on. Each type of flooring material requires routine, periodic, interim, and restorative cleaning procedures in order to maintain its appearance and prolong its life. Janitorial professionals and building maintenance contractors can turn to Jon-Don for a full selection of products, equipment, and chemicals specifically designed for the proper care and maintenance of various types of resilient flooring. 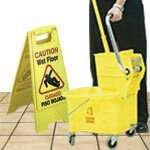 Customers can also request a FREE copy of the Life Cycle of Floor Care manual. This full-color, illustrated guide covers the step-by-step procedures required for all hard floor maintenance procedures. This manual includes instructions in both English and Spanish. For additional assistance in selecting products or on-the-job advice, please contact a Jon-Don Floor Care Specialist at 800-556-6366.